Stepped up already… | Stampers With Altitude!!! 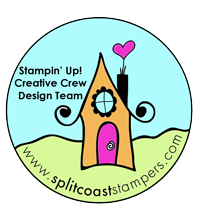 For the month of June, the Creative Crew on splitcoaststampers.com asked us to only do 5 projects, instead of 6. I chose to make this challenge already stepped up and not do the simpler version of this card. I also used this card as a color challenge that my upline put out. The challenge was to make a card with all the In-Colors or to make 5 cards using only one In-Color. So…. I used them all! The stamp set used was Feathery Friends. I used all of the In-Color markers for ink, I used all the In-Colors for paper too! The flower centers have Clear Faceted Gems. Cute huh?